Trigger warnings abound in today’s post. So, last week there’s a day I have off. My mac is back from the shop and working again – and that’s a good thing. It’s also unseasonably warm out, so a humble narrator starts cooking his noodle about finding some cheap diversion to spend the afternoon in pursuit of, which – as any New Yorker will tell you – ain’t that easy. It occurs to me that I haven’t been to the Central Park Zoo in a few years, and since the price of admission is just twelve samolians, a visit is within my means. Alternatively, I’d go take a walk around the Newtown Creek, but I just wasn’t in the mood for pollution and devastation this particular day, so off to the City I went in pursuance of getting some charming shots of the critters which the Manhattan people hold captive for their amusement. The trip also fit into the whole “House of Moses” thing I’ve been doing all year, wherein I’m trying to visit as many of the Robert Moses built projects scattered around the City as I can. Central Park Zoo, the original I mean, not the modern version which was rebuilt in the 1980’s, was one of Moses’s flagships. I enjoy shooting critters, even if they are the captives of the Manhattan types. 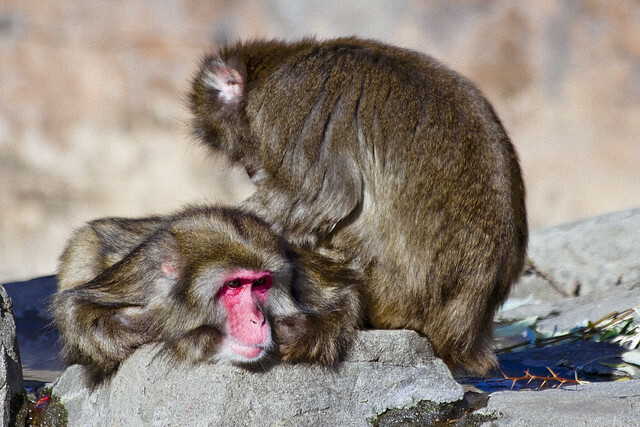 The Japanese Snow Monkeys… is it still ok to refer to the national origins of a monkey… I don’t know. 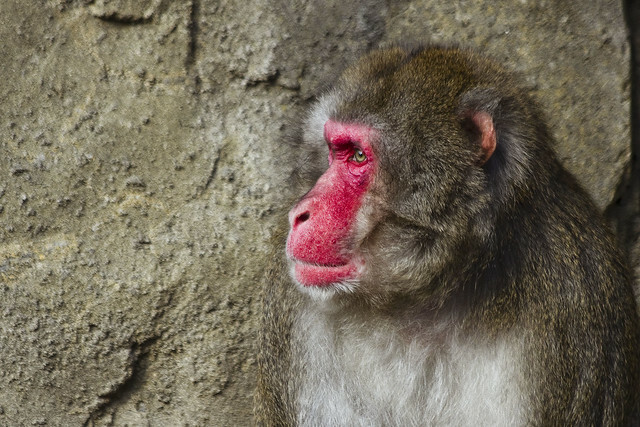 Does it make one a specist, referring to the particular clade of primate which a creature is? How about the snow part? The world has changed, and so has language, in the last few years. Is this creature a “cisprimate?” I don’t know. Is it ok to use “critter” anymore? Is there an approved thesaurus which vouchsafes the linguistic sensitivities of every possible iterate? I’m old now, and hail from a violent and ignorant era where half of the nicknames from my old neighborhood in Brooklyn would now be prosecutable as hate crimes. I’d like to reach out to the college campus types to advise. While pondering the incomprehensible mine field offered by the overly sensitive and “waiting to be offended” types, the… beings(? 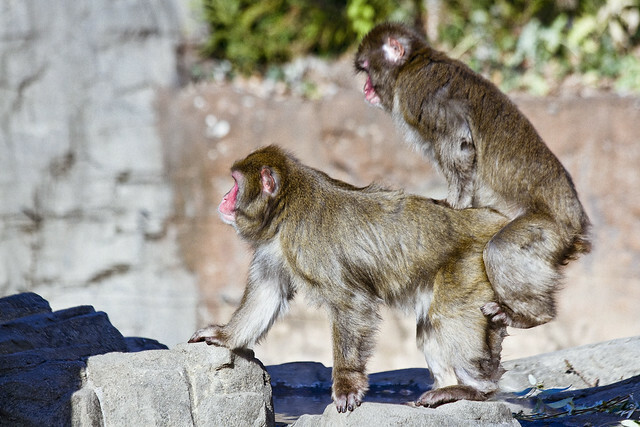 )… were engaged in that most primatological of behaviors – grooming each other. Ahh… that’s nice, said I, and focused the lens in on this pair. My triggers all began to pull without warning, and a humble narrator was reduced to a shivering wreck. Didn’t these “beings” realize that there were children about at the zoo? There were no consent forms exchanged between them, nor “safe words” negotiated in the presence of a third and impartial party. The Zoo displayed no signage warning me about what might be encountered on their grounds, and at no point was I offered a safe space in which to recover from the bestial display which the organization just allowed to happen. I had to make due with the Penguin house. Unbridled, and with zero concern for the casual observer, these creatures continued their lewd act. One wishes that he could have stopped photographing it, but every muscle in my body had involuntarily spasmed into the position it was in when this display started, and my camera shutter just kept on flipping. Oh, unhappy act. 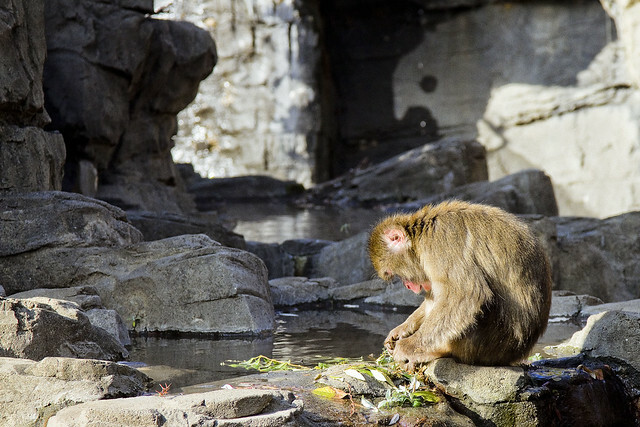 I intend on instituting a law suit against the Central Park Zoo shortly after this post is published, as I have been materially damaged and will never be able to photograph a primate again without revisiting this scene. In effect, I have been raped by my willful observance of this act of sexual violence, and my delicate eyes will never be able to look upon a Curious George book again without micro aggressions rocking the mirrored surface of my mind. After this occurrence, which was as serious an offense as the Nazi extermination of the Jews to one as correct, and politically sensitive as myself, a humble narrator returned to his darkened rooms to sit and shake while whimpering. How dare these primates parade themselves thusly, knowing that others might be offended by their public actions? This never happened while Bloomberg was Mayor, and therefore it must be de Blasio’s fault. These apes need to be sent to a sensitivity training camp, and educated in proper societal etiquette. Accordingly, an announcement is offered that I’ve founded a new non profit which offers this service to zoo animals, for which I’m applying to both City Hall and the Federal Government for funding. Are you pulling out legz?!? !…Twelve Samolians?? ?…Now how the hell are we all going to schlepp so many those people up from Samoa???? This is my favorite post! Thank you for warning those among us who, like you, prefer life to be carefully curated for us. In my world there are no unkind words, no thoughtless acts, no friction at all, really. Because that is how I picture the world to be, so everything conforms to my will. 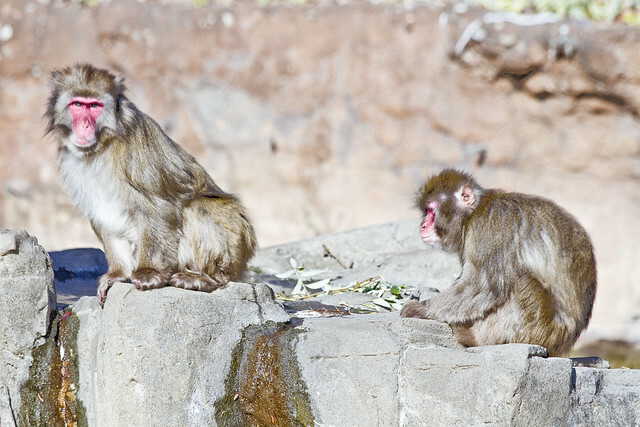 A visit to the zoo is off my list, because those monkeys just don’t listen!